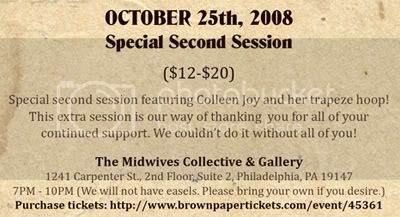 Midwives Collective & Gallery: THIS Saturday we're hosting the 2nd Session of Dr. Sketchy's Philly! THIS Saturday we're hosting the 2nd Session of Dr. Sketchy's Philly! Just one more event in our month long 1 year anniversary celebration! Be sure to get your tickets for this special second session of Dr. Sketchy's Philly! Featuring the lovely and talented Colleen Joy, who will be modeling while suspended on her trapeze hoop, this session will be set in the more intimate Midwives Gallery in South Philly. Sketchy's Philadelphia is brought to you by Nicola Black Design, L. L. C. and The Midwives Collective.